It has been a strange week due to the sadness of the fires up north and terrible air quality just being a drag here. 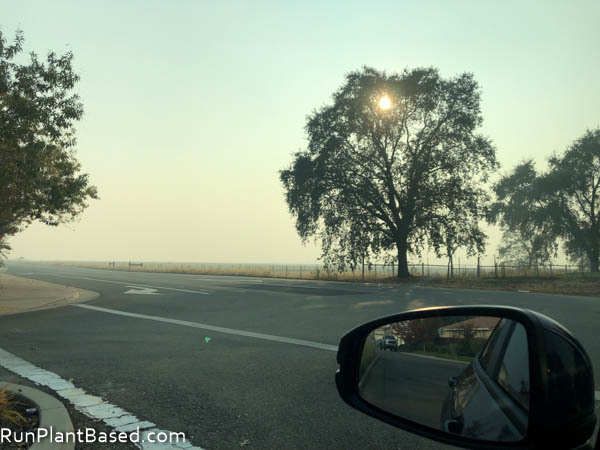 That mixed with the oddly dry weather has made it really hard to get into the holiday spirit and while the air quality is miserable, most are reluctant to complain knowing what fire victims are going through. 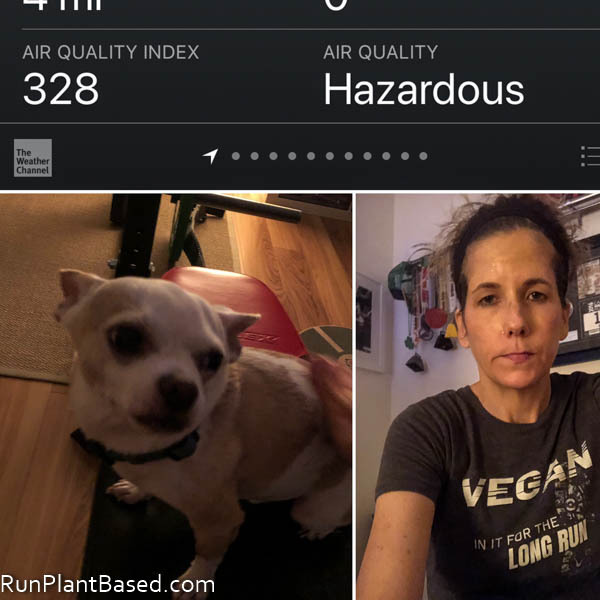 Wednesday night I had an easier workout in the home gym with a restless and antsy Miko because the air outside was terrible. Thursday night was even worse much higher into the hazardous level. 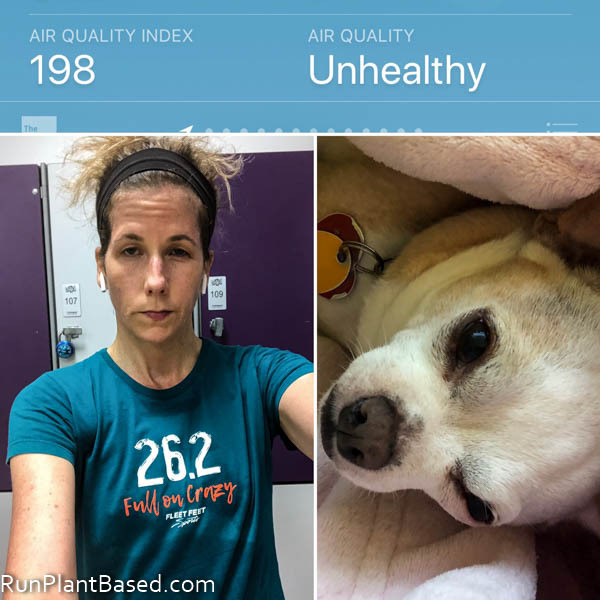 I went to the gym after work and the air seemed okay and I felt okay doing an easier treadmill run, but it was looking hazy inside when I left and my eyes and throat really felt it for the quick parking lot trip to the car. So it was a simple tofu marinara stir fry for dinner after. 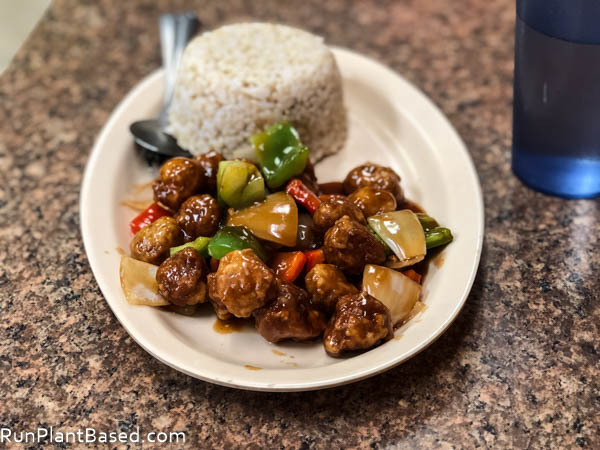 By Friday I was feeling pretty burned out and draggy after a week of truly sad news and functioning in the terrible air quality, we had an easy lunch at Pho Vegan Asian Cuisine again. And the orange mock “chicken” was delicious with brown rice. 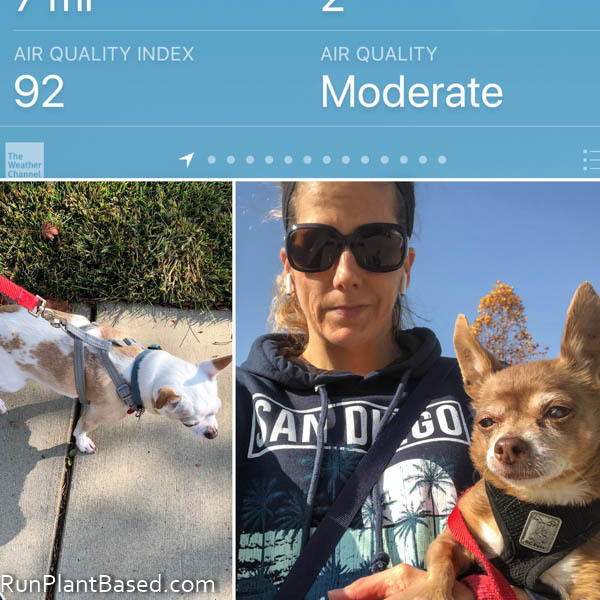 We typically go out Friday night, but the air quality was terrible again and I actually started getting a migraine which I haven’t had in ages. After taking Excedrin, we decided to stay in and play in the kitchen for dinner and watch a comedy. 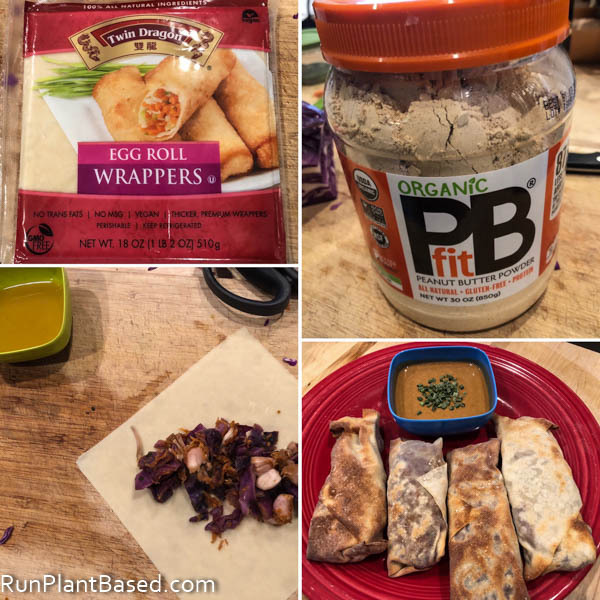 I used Twin Dragon Egg Roll Wrappers to make simple cabbage, carrot, and jackfruit air-fried egg rolls and made a lighter peanut dipping sauce using PBFit Organic Peanut Butter Powder. First time using egg roll wrappers and it was fun! The Twin Dragon wrappers are hearty for loading up and get a crunchy and tasty texture being after being air fried with no oil. 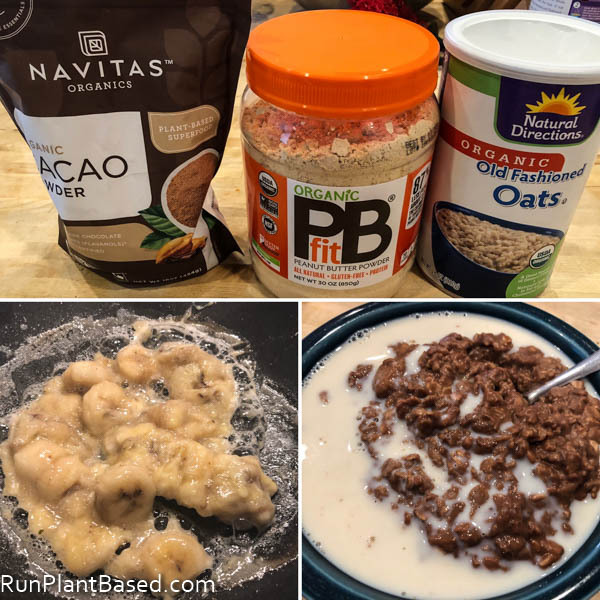 Saturday morning got off to a slow start, I slept in and made chocolate banana peanut powder oatmeal for breakfast. Bananas turn into a tasty gooey treat when sauteed in a wok and made a great addition to the oatmeal. We also got a brief break in the terrible air with it only being moderate, so I took to pups for a long walk which was the first one in a week, poor pups! Okay, more of a carry for Leela, but she enjoyed pooping and sniffing when she felt like it. By the afternoon yesterday, the smoke started rolling in again and looking awful. So we stayed inside again to eat leftovers and watch funny movies. And today it was not great again at an unhealthy level, so I headed to the gym and ran for an hour on a treadmill while zoning out to the Rich Roll podcast. And Miko is not happy and very clingy again today for not getting a long walk, I don’t blame him! 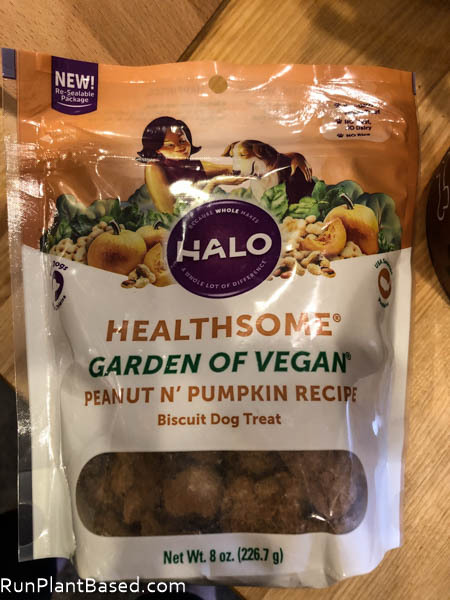 But we did try new vegan dog treats this week – Halo Garden of Vegan Peanut n’ Pumpkin Recipe. Leela loved these right away, but she loves to eat just about anything at this point. Miko was a little unsure because they’re thicker and crunchier than his other treats, but he likes them broken into smaller pieces. Hopefully we get some rain and wind next week to help the fire fight and air quality, at least that’s what the forecast is showing for now. And maybe a little holiday spirit for Thanksgiving which will be small and quiet this year. I still love the Tofurky Roast. No such thing as a perfect vegan and that’s not the point. Wow, another new vegan milk to try! I hope you get your holiday spirit back Christine! 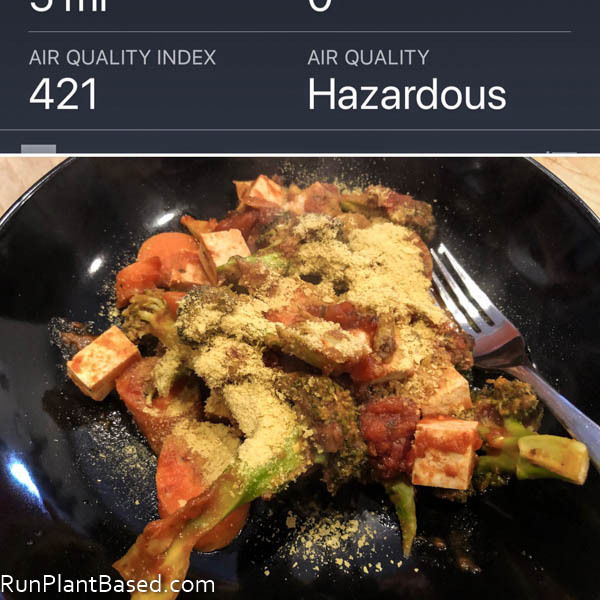 But my goodness…those fires and air quality issues…how terrible! I guess I should just feel blessed that’s it’s only freezing cold here. Saying a little prayer for you all. Thanks and I hope everyone affected by the fires can have some too. You’re so sweet, I will take freezing. But the air quality is already much better today. Crossing fingers and toes that the rain predicted on Wednesday actually comes through to clear the air. Thanks, they are fun to play with and I still have more! The egg roll wrappers are great air fried. Me too on the rain!